By early August 2000, Rich Garces had already appeared in 46 games in relief for the Red Sox, The Hartford Courant wrote. He'd played in seven previous major league seasons, never getting into more than 30. "The teams I played with before," Garces explained to The Courant, "I never got the chances to go out there and prove myself." Once he got that chance, Garces ran with it for two seasons. By the end of the year, Garcas' game total hit 64. The next year, it hit 62. To get that kind of major league time, Garces had waited more than a decade, is career beginning 13 years earlier, signed by the Twins as an amateur free agent out of his native Venezuela. Garces started with the Twins at rookie Elizabethton in 1988. He hit single-A Kenosha in 1989, then high-A Visalia and AA Orlando in 1990. 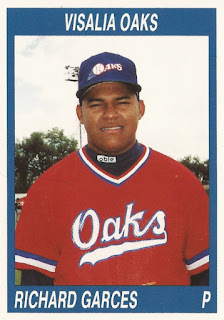 By August 1990, Garces had turned reliever, recording 32 saves between Visalia and Orlando, The Orlando Sentinel wrote. His manager at Visalia Scott Ullger had nothing for The Sentinel but praise for Garces. "He's not afraid to work hard, and he's working on a split-finger to throw against lefties," Ullger told The Sentinel. "If he gets that down, then no one can touch him. He's a good athlete and good fielder. Don't forget that this kid is just 19 years old. He's just mature for his age." By that September, that 19-year-old was in the majors. Garces debuted with Minnesota Sept. 18, getting into five relief outings. He gave up one earned run in 5.2 innings of work. Garces, though, didn't return to Minnesota for three more seasons, getting three outings for the Twins in 1993. Garces then moved to the Cubs and Marlins systems for 1995, getting into 18 games between them. From there, Garces made the majors each season through 2002. For 1996, Garces found his home in Boston. He got into 37 games that year, but 12 the next. He then got into 30 games in each of 1998 and 1999. He then finally came into his own in 2000 and 2001, getting into more than 60 games each season. He then saw his final major league time in 2002, 27 games with the Red Sox. In July 2001, in the midst of his second 60-plus outing season, Garces recorded a 13-inning scoreless string, according to The Courant. "I just do my job," Garces explained to The Courant. "I hand the ball to Rod Beck, who hands it off to Derek Lowe. That has worked."